First Minimates, now Marvel Legends - why is it that the only way to get the people who support Captain America is as an exclusive? 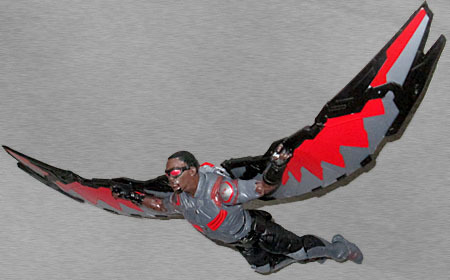 A defender of justice, Falcon soars into battle with his EXO-7 wings and Redwing drone. Sam Wilson was introduced in Captain America 2: The Winter Soldier 1 (and had a brief cameo in Avengers: Age of Voltron), but it wasn't until Civil War that he got a superhero identity. It's the same way that Clint Barton was just Clint Barton when he showed up in Thor, but became Hawkeye in time for Avengers. You can't simply jump straight into the wild heroics, you've got to ease into it. (Black Widow is an exception, because she was already well into the covert ops and the secret identities when we first met her.) So he may have started out slowly, but he's definitely catching up quickly with the rest of the team. Of course, hanging around with Steve Rogers is enough to inspire anybody to greatness. In Winter Soldier, Sam wore grey fatigues - a holdover from his military days - but that won't cut it now that he's officially assembling with the rest of the team. The updated costume actually debuted in Ant-Man, and consists of an armored vest over a fancy zip-up shirt, fingerless gloves with different-sized gauntlets, pants with loops for the straps of his harness to slip through, and heavy armored boots. 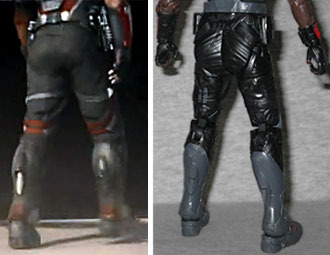 The red stripes on his chest reference the character's comic costume, and the boots appear to have little jets on the back of the calves, possibly to help with maneuvering. He's missing the technological stuff on his hips: that's where his guns come from, thanks to the magic of CGI. The figure is not very colorful. His shirt and boots are grey, with a few spots of silver and some dark red lines. His gloves and pants are black, again with some brighter accents. So the main colors are dark red, dark grey, and black - like we said, not colorful. And yet, it's more colorful than the actual movie suit, where the shirt and pants are pretty much the same color. There should also be some red and silver apps on the back of the legs, but this is already a store exclusive with a fully unique mold, so a corner had to be cut somewhere. 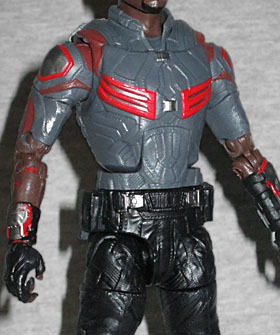 Falcon is played by Anthony Mackie, and since the character doesn't wear a mask, that means this toy has to have an Anthony Mackie likeness. We don't get a completely bare face - his goggles are a permanently attached part of the mold - but the parts we can see definitely look like him. An alternate head would have been nice, but this is fine. We do get good accessories though. 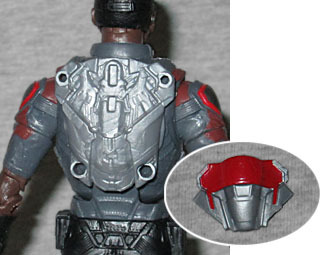 No guns, sadly, but unlike the last Sam Wilson Hasbro made, this one does get his wings. 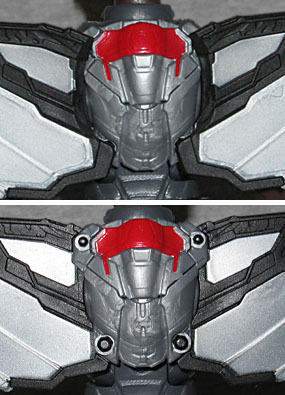 They add much more color to the toy, with their black frames and red and silver panels. They're each a solid, unarticulated piece that curves backward from the body, and they're missing the handles that actually allow Falcon to hang onto them in flight, but it would be silly to release the figure without wings. Instead of plugging directly into the figure, the wings attach to a backpack he wears. Yes, that's another separate piece, so if you want Falcon to be completely without his namesake flight harness, he can be. And if there were any other figures who had two holes in their back, you could give it to them, instead! But there aren't, so you can't. For the best fit, don't attach the wings to the outside of the flightpack, like I did: instead, attach them to the underside. They'll curve forward around the body, and they'll fit against the pack even better. Anthony Mackie was really pulling for a more comicbooky version of Falcon, complete with red spandex and a pet bird. The Russo Brothers weren't having any of it, but they eventually relented at least a little: not only does his armor reference the old costume, but he's got Redwing, too! Okay, in the comics Redwing was an actual bird, and here it's just a robotic drone, but that's still cool! 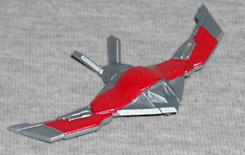 The movie shows the drone launching from the flight pack and unfolding, which obviously this toy can't do. Instead, there's a folded version that can store in a notch in the backpack, and an unfolded version that can you fly around. There's not a lot of paint on it (the underside is completely bare), but at least the wings are red. 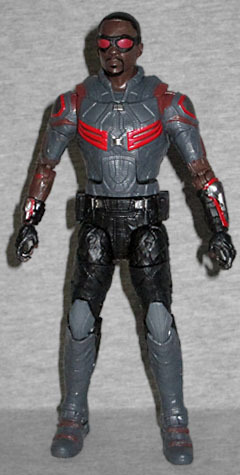 Falcon is, like Bucky, a Walmart exclusive. When these figures were first announced, the implication was that they'd come in a two-pack, but now that they've begun showing up (in evenly packed cases of six), we know they're solo. Falcon is the better of the two figures, and has the advantage of never appearing in this scale before.